Remotely control your iTunes from your browser. Is there a better alternative to PatioTunes? Is PatioTunes really the best app in MP3 category? Will PatioTunes work good on macOS 10.13.4? 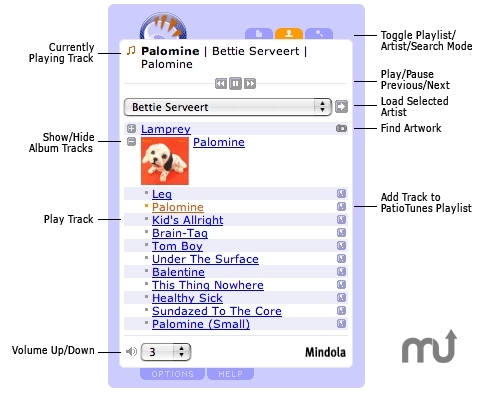 PatioTunes is a program that lets you control iTunes from any browser over your home network. Pick artists, albums, or your available iTunes playlists; control play and pause, set the volume and see what's currently on the air. Best of all PatioTunes is simple. There's nothing to setup. No Web server settings to configure. Double-click to start and leave running day and night on any iTunes Mac with a connection to your home network. PatioTunes needs a rating. Be the first to rate this app and get the discussion started!